Selecting the right light fixtures for open concept dining rooms is particularly important to create flow and interest. Get my best tips! One of my current client projects involves a decorating plan for an open concept living room, dining room, and kitchen at the back of the house. As gorgeous as these spaces can be, decorating them involves careful consideration to achieve a specific mood or feel for each area, while maintaining a cohesive and balanced look throughout the overall space. Selecting the right light fixtures for these types of spaces is particularly important in order to create a sense of flow and interest. With the dining room smack dab in the middle of the living room and kitchen, it’s important to get this light fixture right. Too heavy or cumbersome, and the sight line will be impeded from one side of the house to the next. However, if it’s too small or insignificant, it won’t give the dining area enough presence, and the table could appear to be floating in the middle of the space instead of being anchored. Aside from these considerations, it’s also imperative to think about the style and size of the table in the dining area. 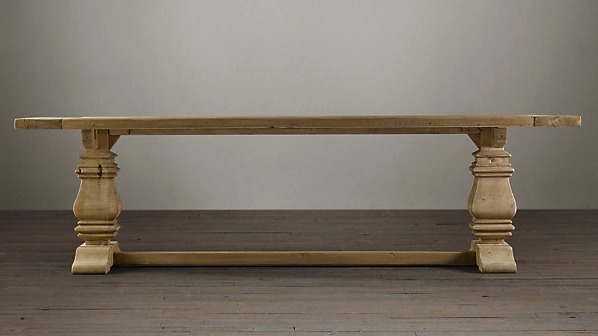 We have already discussed a few options for the space, and my client is leaning towards a Salvaged Wood Trestle Table. 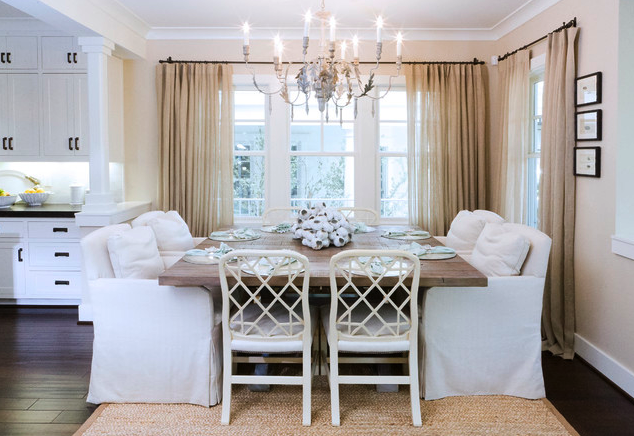 Typically the light fixture in your dining room should be about one-third the length of your table. If the table is 84 inches long by 42 inches wide (as in this case), the lighting fixture should be about 28 inches in diameter. Another rule is to take the width of the room and multiply it by two. The number you get is the approximate measurement in inches that would be ideal for your space. For example, this dining room is 11 feet wide, so the light fixture diameter calculation is about 22 inches. Of course these are only ballpark figures, and size of the light fixture can be adjusted up or down depending on the openness of style or heaviness of colour or material. For this particular dining room, there are several options I can see working very well. The first that comes to mind is an open cage chandelier, which always seems to be the perfect balance between traditional and modern styling. I love that it has presence, but the openness of the design makes it a great choice for these kinds of spaces. Another option is a skinny-arm metal chandelier. This light fixture choice could be cheated a little on the larger side because it reads less weighty. There are many versions of this style of chandelier, including those with crystals and beads, and those a little more clean-lined. Many versions could work. Another option that would be stunning in this space is a glass chandelier. 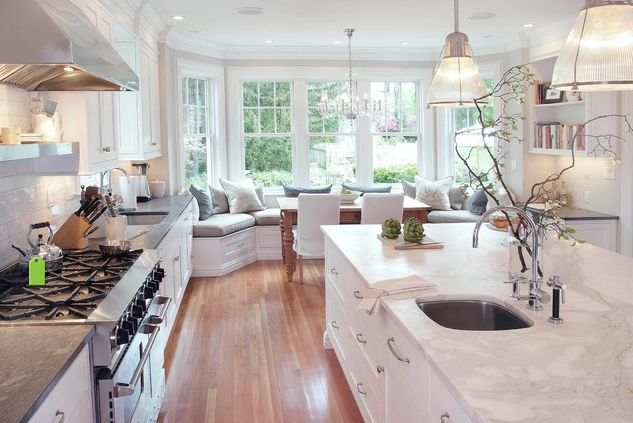 These fixtures basically disappear during the day keeping the space looking light and airy. At night they provide additional lighting and a hit of drama. The final suggestion for this space is a capiz shell chandelier. These light fixtures reflect the light beautifully and tend to work with any colour scheme. They also bring a bit of natural texture to a space. Have any favourite light fixtures for open concept dining rooms? I’d love to know what your choice would be. Oh, such lovely photos Shauna! I think for an open concept space it should be big, whatever you decide! 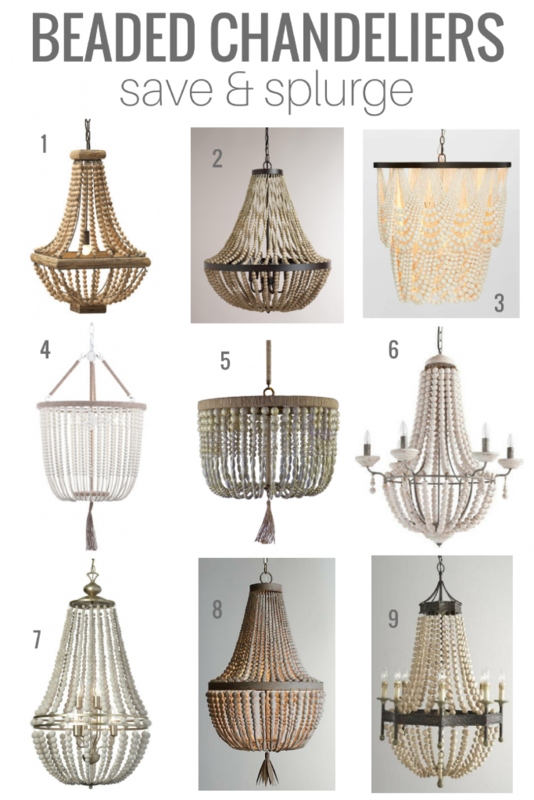 I love the open cage chandy (first one) and the capiz chandy too! I can’t wait to see how your client’s dining room turns out! The trestle table is a great choice! pinned! I had no idea how to judge size, so thanks! We have a table very similar that we had custom made for us so please post finished pics when you can! Love these rooms! My problem is that the fixture hole is in the wrong spot for where the table should go. We have open concept, but the room assumes the dining area is smaller than it is. Darn builders. See it all the time! Love all of them – such a hard choice! I think I’m leaning toward open-cage. Can’t wait to see what you pick! I think I like the open cage as well! Love all your inspiration pics… I’m a huge fan of a round dining table! We need a new table in our open concept space. I am considering replacing the light fixture too. There’s nothing wrong with it, it’s pretty new. But it just doesn’t make a statement or pull anything together. These are great ideas! Thanks for the great tips, had no idea there was a number ref scale of light fixture… I always eyeballed. Filing that tip away! It’s just a ballpark number and really depends on the style of the fixture and what the material is. Sometimes the rules are thrown out the window to make a statement too. I had NO idea that there was so much math involved in lighting – thanks for the tips!!! I love lighting, and am drawn to so many different options, but for me I’m always pulled back to Tom DIxon’s ‘Beat’ pendants – I’ve loved them now for over 2 years, but they definitely need to be in the right setting to be truly showcased. I also really love the clear globe pendants… do you see my dilemma? almost dire opposites!